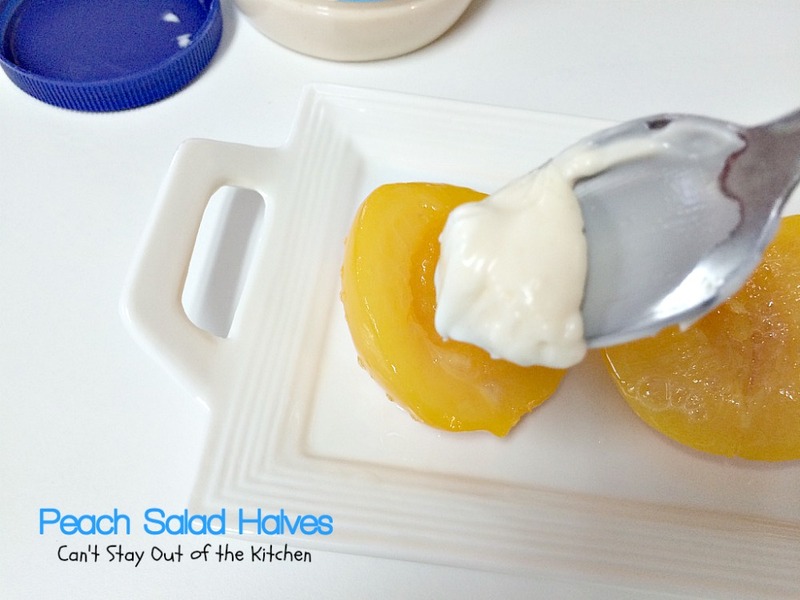 Peach Salad Halves are scrumptious. I love this simple, easy and delicious fruit salad recipe. It has only four ingredients–canned peach halves, Miracle Whip, pepper and cheddar cheese. 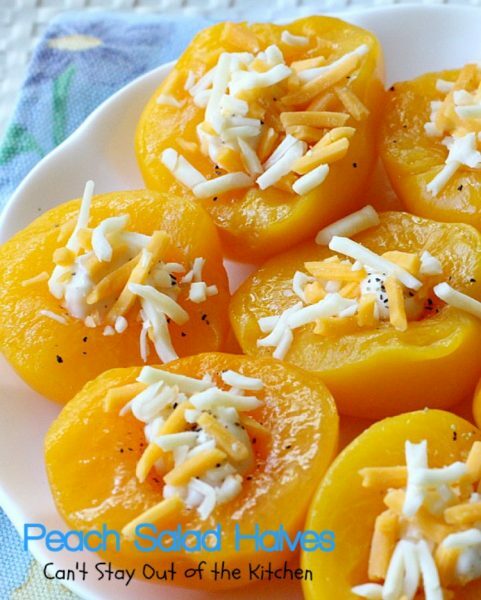 So easy, yet the savory flavors of the cheese with the sweetness of the peaches makes this lovely fruit salad recipe surprisingly good. Back in the late 70s we had friends invite us over for dinner one night and she served Pear Salad Halves. I made that recipe regularly for years. Then one time I decided to try the recipe with canned peaches instead of pears. Wow. Using peaches turned out just as nicely as pears. This simple fruit salad is a great complement to any main dish meal, but goes especially well with pork or as a potluck side dish during the summer holiday season when BBQ ribs or chicken is on the menu. The nice thing about this recipe is you can find canned peaches all year round. If you have peach trees (like I used to have) and you have enough of a harvest to can some of your peaches, this is a great way to use up homemade canned peaches. While you can use mayonnaise if you are averse to Miracle Whip, you will have to sprinkle the mayo with a pinch of sugar to accomplish the same flavor. We had some friends from John’s office recently move into a new home in our new housing development. It had taken them over a year to get their house built as he was his own contractor. I offered to bring them a meal on moving day and asked them what they liked to eat. Angela said she wanted lasagna. So in addition to the main course I thought these little peaches would be refreshing and tasty. While I was at it, I also made some with Pears, and tossed in some Easy Garlic Parmesan Knots with Easy Marinara Sauce for dipping. I topped off the meal with Monster Cookies and threw in some Raspberry Lemon Streusel Muffins for breakfast the next day. They loved everything. Because I was making so many things, I liked the idea that this delicious salad could be made up in about 5 minutes time! Peach Salad Halves are a quick and easy side dish for any occasion. Peaches made this way are completely amazing. This is also wonderful made with pears. 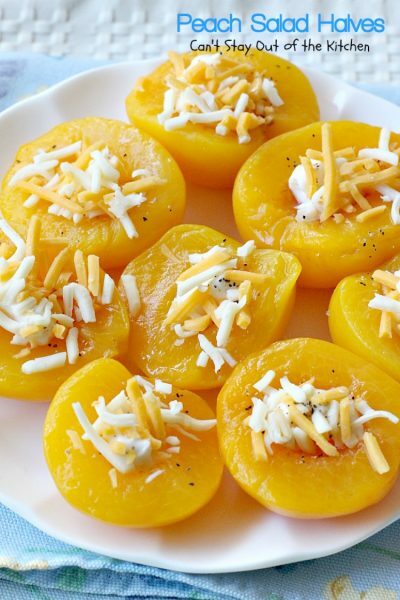 Peach Salad Halves are a great side for holiday dinners, too. Place peaches on a serving dish. 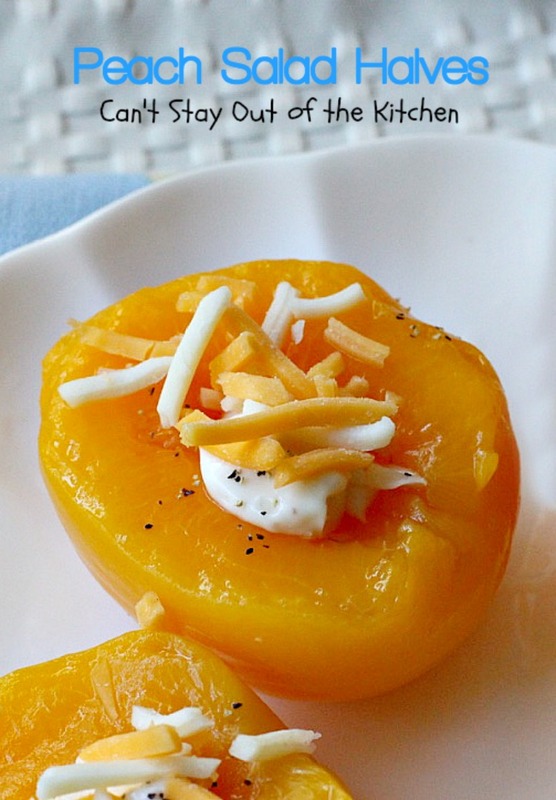 Add a small dollop of Miracle Whip into the centers of each peach half. Sprinkle each peach very lightly with pepper. Sprinkle about a tablespoon of sharp shredded cheddar cheese or any combination of cheeses in the center of each peach half. 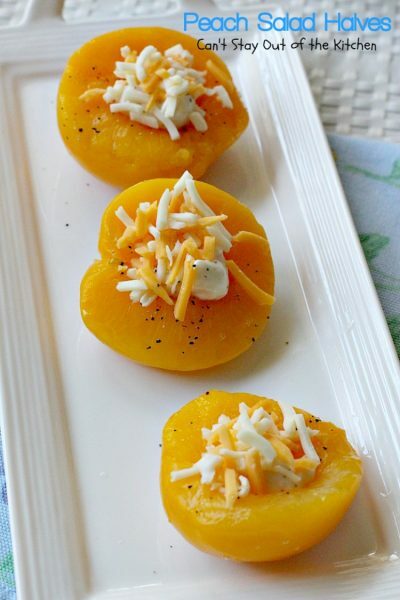 Serve Peach Salad Halves as a delightful company side dish. This lovely fruit salad is so quick and easy because it only uses 4 ingredients! 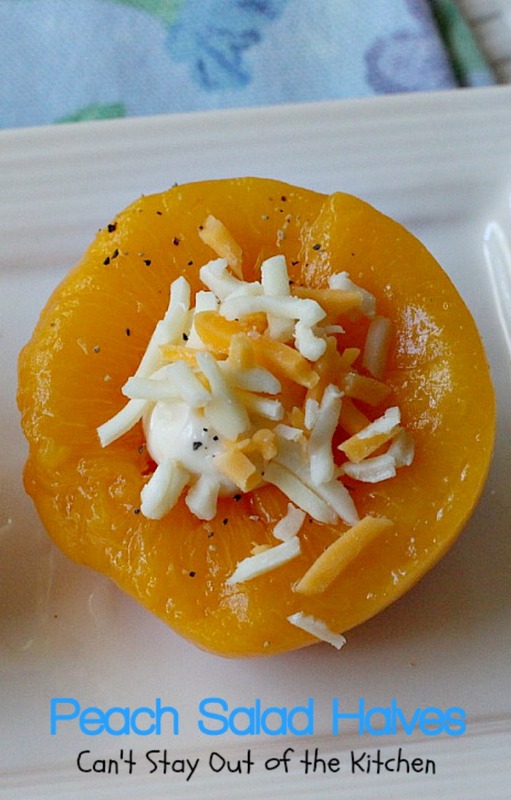 The savory blend from cheese with the sweetness of the peaches combine for a stunning combination. This is a great salad for holiday menus. Please desired amount of peach halves in baking dish or pan. Put about ½ to 1 tsp. 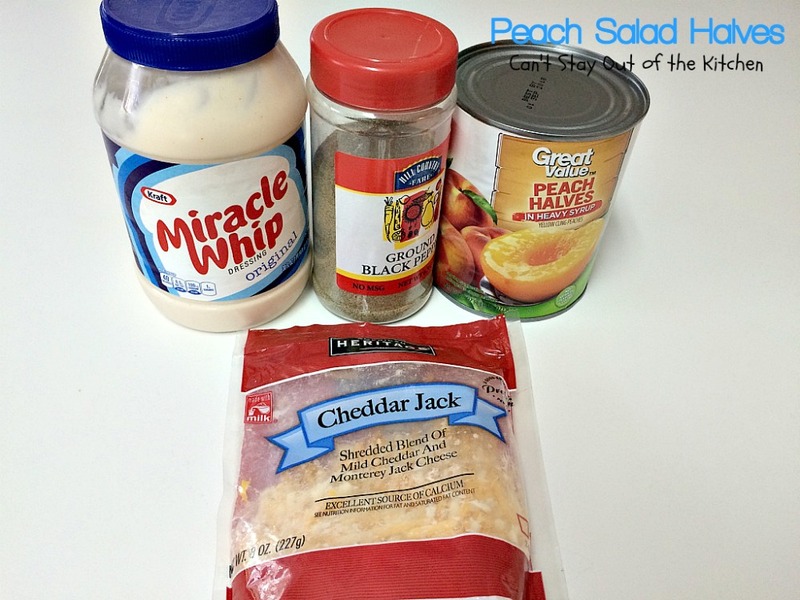 Miracle Whip in the center of each peach half. NOTE: If you substitute mayonnaise for the Miracle Whip you will need to add a little sugar to the top of mayonnaise before adding cheese. NOTE: Each can yields about 8-10 peach halves depending on the size of each one. If you substitute mayonnaise for the [url href=”http://www.kraftrecipes.com/RECIPES/DINNER/miracle-whip-recipes.aspx” target=”_blank”]Miracle Whip[/url] you will need to add a little sugar to the top of mayonnaise before adding cheese. [br][br]Each can yields about 8-10 peach halves depending on the size of each one. 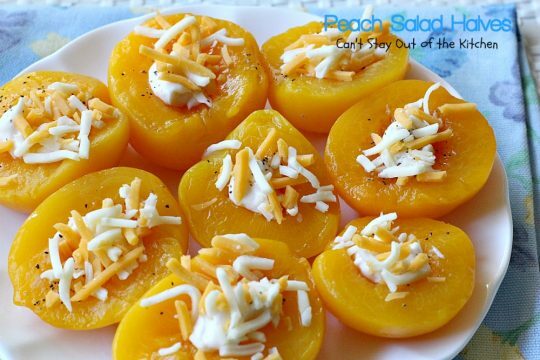 This delightful salad has the delectable savory flavors of cheese along with the sweetness of peaches. The flavors co-mingle and become wonderful. I made Peach Salad Halves for some friends who recently moved into a new home. They loved them. You may find these items helpful for making these recipes.